More and more people are going online using their smartphones and tablets. The popularity of mobile devices and the rapid progress of mobile technology have helped usher in this growing transition of going online. Along with this, new mobile browsers are coming out to give mobile users a better browsing experience online. One of them is the popular Mozilla Firefox browser which now has an Android version. 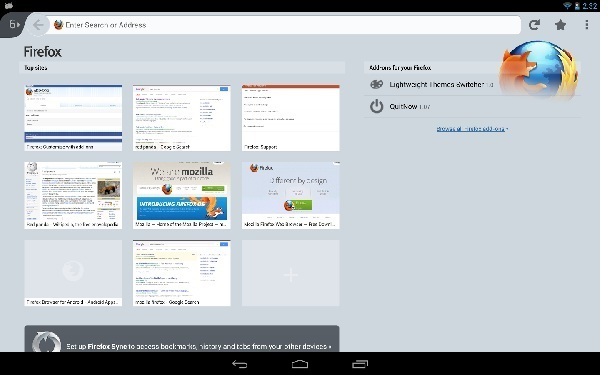 The Firefox Browser for Android provides a fast and easy way to browse through the open web using portable Android devices. It has also been updated with other features that have made it quite a popular and capable web browser for desktops. Mobile devices may now also enjoy almost the same features when using the Firefox Browser for Android. Among the features of the mobile browser include the ability to install add-ons to the mobile browser to make it even more versatile. The mobile version of the Firefox also has the Awesome Screen feature which keeps the user’s favorite websites organized into an easy-to-read page. The browser also has been designed for viewing mobile videos. The Android version also provides support for HTML5 and Web API’s. The Firefox Browser for Android is available for free download at Google Play.